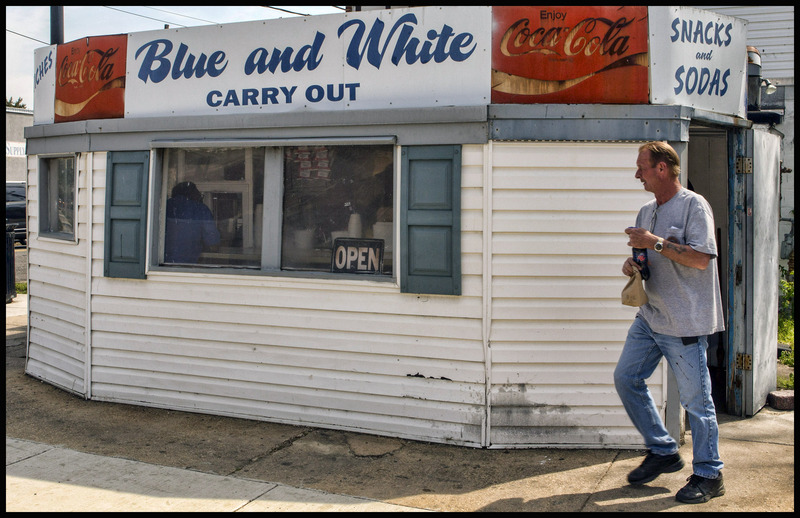 5:30 a.m. – 3:00 p.m.
Blue & White is a community institution. This is good southern comfort food dished out in huge portions, a real working class breakfast and lunch spot. You may have to stand in line with quite a diverse clientele, and only bring cash, no credit cards are accepted. The staff at the Blue and White are very nice and traded humorous and witty remarks as they prepared the food. It’s a tiny place, carry-out/take-out, with no seating. 1 – When did you first become interested in cooking and what made you choose a culinary career? I just enjoyed cooking, when I first started to help my mom when I was a kid. Mom had to go to work at nights, so I had to take over caring for my sister. I kind of learned how to cook by myself with her help. I had to learn on my own to feed myself. I became somewhat creative and now I can cook a lot of things. I’ve been here for 34 years – my uncle bought this place in 1972. I came to help him out in 1976 when I was 15 because he was getting tired and needed help. He had a heart attack so he had to retire. Then I took over in 1982. Which dish on the menu are you most curious to see how it’s received? Our menu consists of fried chicken, pork chops, hamburger steak, breakfast sandwiches, home fries, bean soup and collards. The main attraction is the fried chicken. It’s lightly seasoned and then fried “just right” resulting in a moist, delicious golden skin coupled with juicy meat – it definitely embodies real southern cooking. You can get it plain or with salt, pepper and hot sauce. Everything is great; just simple and honest food. 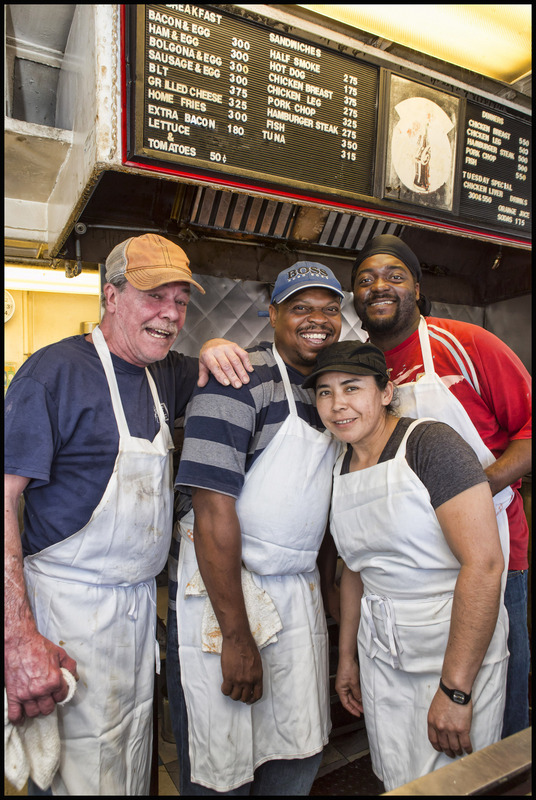 Tuesday is chicken liver day which usually sells out around 11 a.m.
We’ve got really good prices and the food quality is top notch – this is real down home cooking. Because everything is fresh all the time and I cook the bean soup form scratch and we usually sellout every day. The chicken comes in fresh every morning and I start cooking at 4:30 a.m. When we sell out of a dish that’s it. Most of the people who come to Blue & White come here again and again and I know them by name. We’ve survived because the people in Old Town have been loyal. Me or maybe Chef Dennis Marron, who eats here on his days off. He loves the bologna & egg sandwiches. Chef Dennis Marron has run several kitchens for the Kimpton Hotel brand –– most recently he’s the executive chef of The Commoner in downtown Pittsburgh. Shrimp or most any seafood. Chicken Leg/Thigh Sandwich w/Hot Sauce, Chicken Breast Dinner, Hamburger Steak Dinner, Pork Chop Sandwich w/Hot Sauce and Bacon, Egg and Cheese Sandwich. If you would like to see your favorite chef featured here, please send contact information to chester@chestersimpson.com. « You’re KIDding me, right?! Love seeing this place featured. It may not be some fancy spot that folks are used to but the food is 5 star all the way.